When you travel, do you oftentimes find yourself lacking a certain aspect of your daily routine? If cooking is something you enjoy doing then you should be able to do it while away. 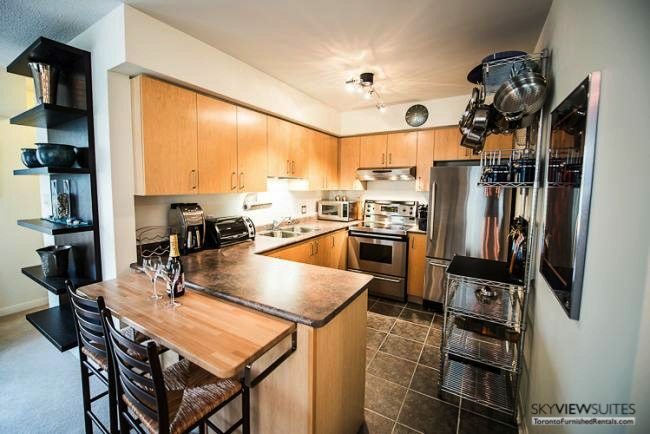 Staying at this furnished apartment in Toronto you don’t have to cut back from home made food. Our two story one bedroom plus den fully furnished rental comes equipped with a sharp kitchen including pans and pots stored in one spot. Stainless steel appliances line the countertops and cupboards, seating for two hangs off of the exit. Entering into an open spaced area dissected into two rooms; living and dining. Each has its function; the couch is immensely comfortable and faces the telly, while the reading chair sits beside the window and has perfect lighting. The dining room comfortably seats four in modern and elegant furniture. Upstairs, the big bright bedroom boasts large windows, a queen sized bed and furniture in beautiful bamboo wood. Ample storage space is in place, and in the den as well; a desk and plenty of book shelves are up against the walls. 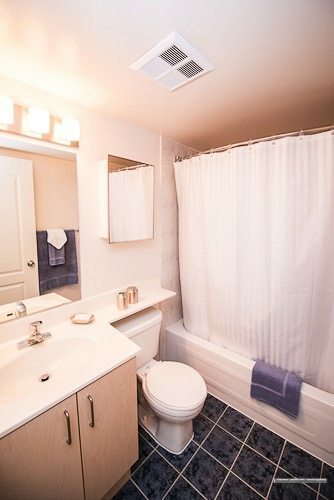 There is a guest bathroom on the ground floor and a master bathroom on the second floor. Additionally, there is a garage underneath the apartment with its own access. Out of all Toronto furnished condos, it is safe to say that this is a one-of-a-kind. 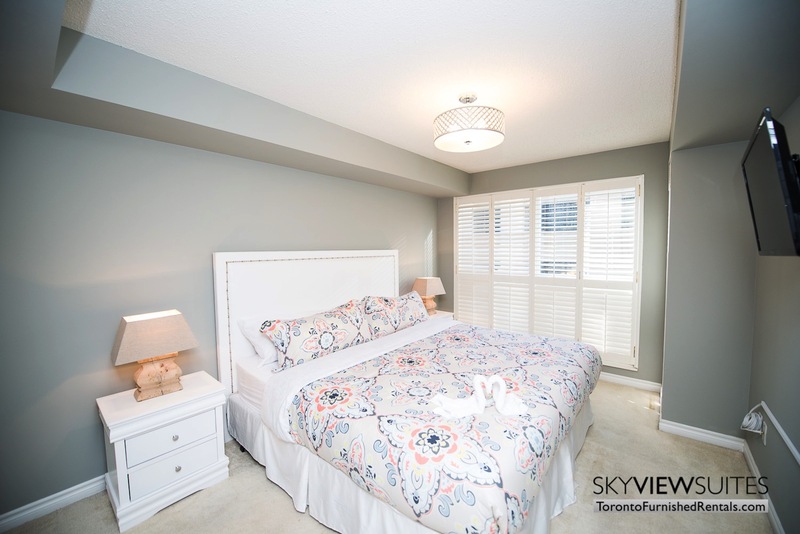 This two-storey ground level apartment is located in a gated condominium complex within the core of Liberty Village, just minutes west of the heart of downtown. Mostly known for its victorious art and design studios, and how close it is to King West and the Lakeshore. Liberty Village is presently one of Toronto’s hottest neighbourhoods on the real estate market. What’s great about this Toronto serviced apartment is that it has it’s a private rooftop terrace for some outdoor space. And if that’s not enough, there are quite a few parks nearby and it’s only a leisurely 15 minute walk to the beach. Though, if you’d prefer the luxuries of staying indoors, you could do that too. There is free wireless internet, and cable TV for entertainment. Also, an en-suite washer and dryer exist and there is bi-weekly cleaning service which takes care of your towels and sheets. 10 minutes away from this building is the Hockey Hall of Fame, located at the corner of Yonge & Front Street in the lower concourse level inside Brookfield Place. At the same time, it’s conveniently positioned by other Toronto attractions, like the CN Tower, Rogers Centre, Air Canada Centre, and the Eaton Centre. The Hockey Hall of Fame is the best place for any hockey aficionado to discover the hugest collection of hockey memorabilia on earth. The Hockey Hall of Fame consists of 15 exhibit areas dispersed over 57,000 square feet (5,300 metres). Treasures like trophies, game worn gear and other unusual hockey memorabilia are on display here. The main attraction is of course is the Stanley Cup, which is the trophy which is received by the National Hockey League champions every year. For a part of the year, a duplication of the Stanley Cup substitutes for the real award while it’s outside the Hockey Hall of Fame with players or for charitable proceedings. 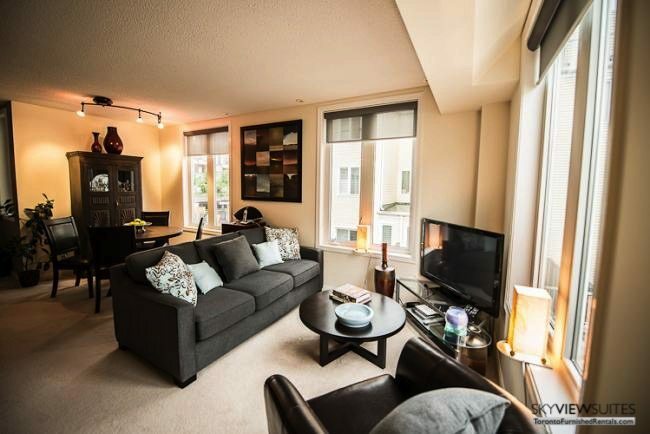 To make your Toronto accommodations at this furnished apartment rental, go to Furnished Rentals.